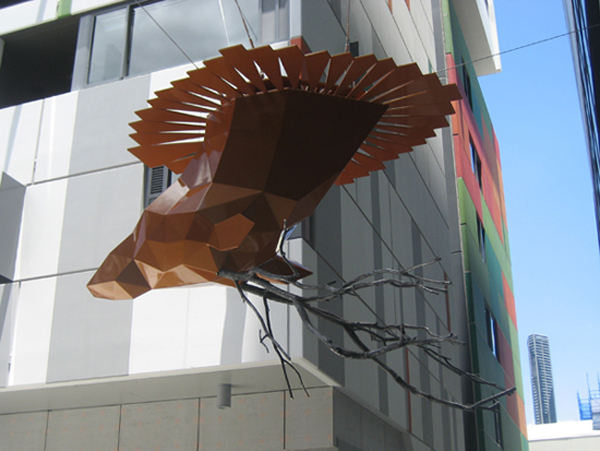 Hart was commissioned as a suspended statement sculpture for an ‘urban lounge’, a new precinct in Brisbane incorporating apartments, offices and cafes. Hart is a reinterpretation of a traditional decorative deer’s head, complete with antlers and architectural fretwork inspired collar. 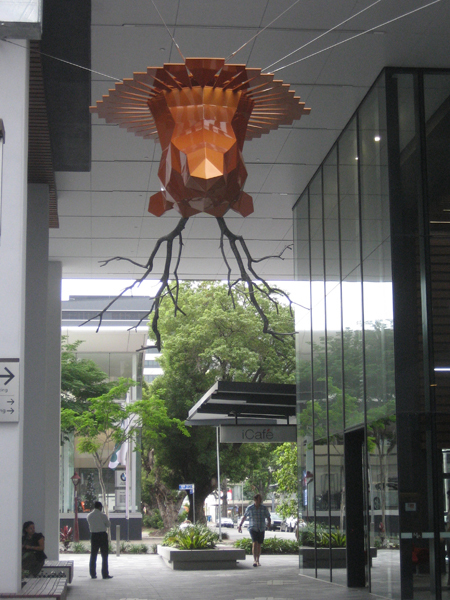 It sits upside down from the ‘ceiling’ in a playful twist on the original wall based form. It is fabricated from gold spray painted sheet aluminium in a facetted format with cast aluminium antlers to radiate the light. The work functions as a central focal point and is positioned in the central lounge area. Hart was developed for it’s potential to transform the space from a modern urban environment into a more intimate living room space. On first approach Hart may appear as a traditional ‘chandelier’ but on closer inspection it reveals its true form.